On 25 July 2014, eight days after MH17 was shot down by a Buk missile system over eastern Ukraine, the French weekly Paris Match published a photograph of a red and white low-loader transporting a Buk through the separatist-controlled city of Donetsk. Subsequent geolocation confirmed that the low-loader hauling the Buk was headed east on the H21 highway. Inquiries by Storyful established that the photograph was taken at “about 11 a.m. on the morning of July 17”; shadows cast by the vehicle are consistent with this time of day. Paris Match also confirmed that this was the best quality version of the image available. Using the phone number on the side of the low-loader, Paris Match contacted the owner of the vehicle rental company, who claimed that the low-loader had been stolen by separatists who had occupied his warehouses since 8 July and that the vehicle was unique in the region. The phone number was also used to track down the exact location of the company, which is located in Donetsk. 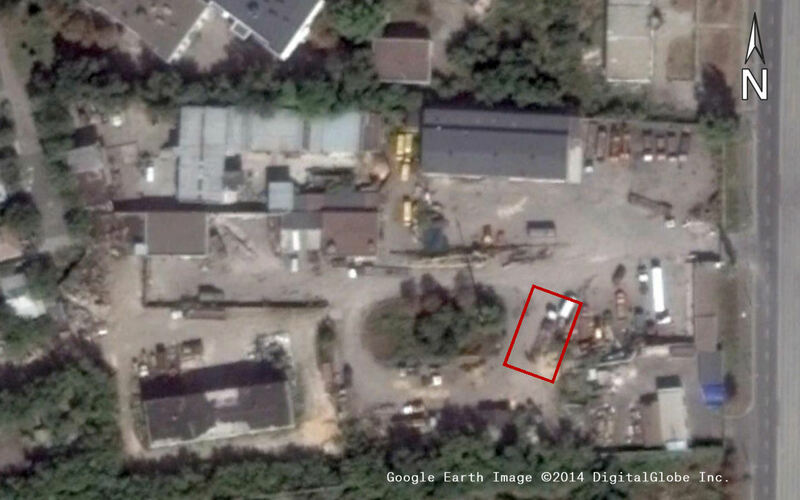 Historical Google Earth imagery shows that the low-loader can be seen in the vehicle yard facing north on 2 July 2014, while on 21 July 2014, it has clearly moved and can be seen facing east. The low-loader’s absence from the vehicle yard at this time is consistent with the timeline of events in the hours before the downing of MH17, as documented in various social media postings, which have been verified by Bellingcat and others. After being spotted heading east on the H21 highway by Paris Match photographers around 11 a.m., the low-loader was subsequently filmed roughly 36 kilometers farther east on H21 in the town of Zuhres, reportedly at 11:40 a.m. The low-loader was then photographed roughly 25 kilometers east of Zuhres in Torez, at approximately 12:30 p.m., this time with camouflage netting over the Buk. While a photograph and a video posted to YouTube showed the Buk driving under its own power in the town of Snizhne at approximately 1:30 p.m., the low-loader was once again seen hauling the Buk through separatist-controlled Luhansk, reportedly on the morning of 18 July, in a video posted by the Ukrainian Ministry of Interior. Indeed, the Buk can be seen missing one of its 9M38M1 missiles. To recap, a Buk being transported by a low-loader was seen headed east on H21 out of Donetsk around 11 a.m. on 17 July 2014, hours before MH17 was shot down. It was then filmed on H21 east of Donetsk in the town of Zuhres at approximately 11:40 a.m. At 12:30 p.m. on the same day, the low-loader was seen hauling the Buk through Torez. 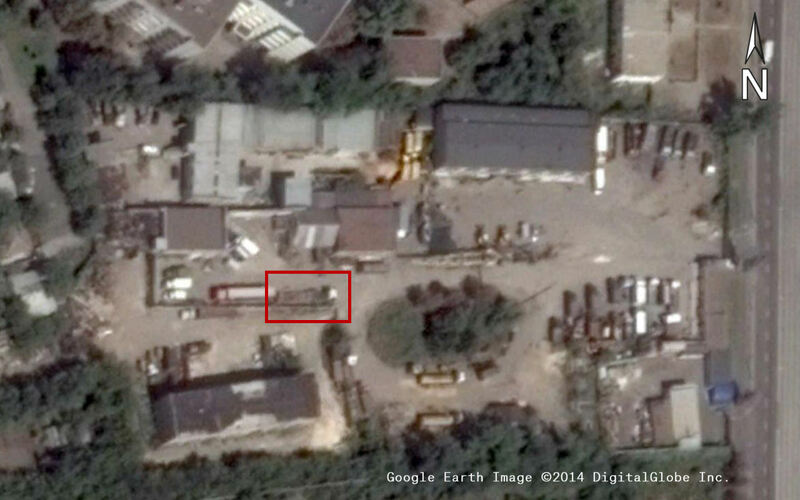 The following morning, the Buk, minus one missile, was seen being hauled by the low-loader through Luhansk. With these sightings, it is possible to surmise the most likely route taken by the low-loader. A portion of this route can be seen in the full Digital Globe preview imagery from which the crowdfunded portion was purchased. This full Donetsk image from Digital Globe – which, after purchasing the imagery, we know was taken at 11:08 a.m. – extends roughly one-third of the way to the town of Zuhres. 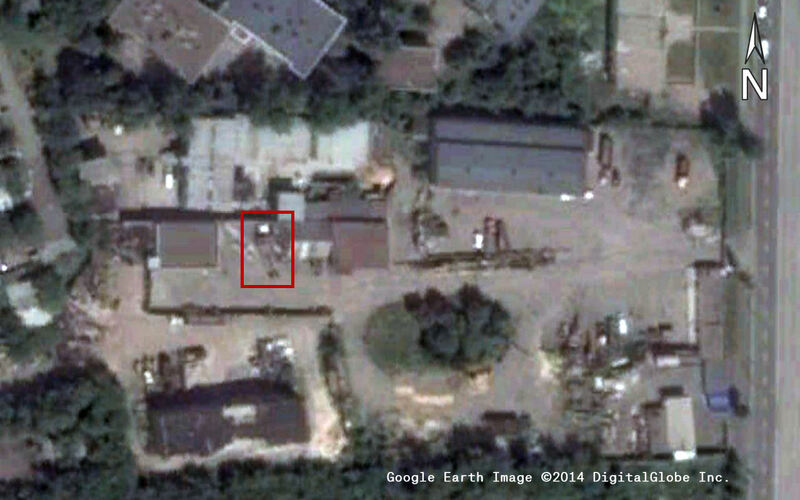 Based on the time of the Donetsk satellite image and the time the Buk was seen in Zuhres (11:40 a.m.), we judged that there was a reasonable possibility that the Buk and low-loader would be visible in the satellite imagery. In order to find out, we crowdfunded the purchase of another sliver of the Digital Globe imagery, this time showing the route depicted above. Unfortunately, the low-loader could not be seen in this image. (We, therefore, will not seek funding for the additional $1,500 required to publish the image.) There are two plausible reasons as to why this may be. First, while the imagery is by and large clear for large stretches of the route, there are not insignificant sections of road that are obscured by either cloud cover or the tree line. Second, the assumption that the Buk would be visible was based upon a number of unknown factors that may have affected the low-loader’s travel time, including the speed of the low-loader, the heaviness of the traffic, and whether any stops were made. On 30 March 2015, the Joint Investigation Team investigating the cause of the downing of MH17 released a video calling for witnesses in eastern Ukraine to come forward with information regarding the transport of a Buk anti-aircraft system through eastern Ukraine. The JIT video also featured three previously unpublished intercepted phone calls in which separatists discuss a Volvo low-loader truck hauling a Buk from Snizhne to Russian territory shortly after the MH17 shootdown. Two of these calls take place between 8 a.m. and 8:30 a.m. on 18 July 2014, the morning after the downing of MH17 and a few hours after the Buk and Volvo low-loader truck were filmed in Luhansk headed east. The individuals in these two calls can be heard discussing, among other things, the whereabouts of the low-loader (or “lowboy”), which was apparently transported into Russia. While the low-loader was taken to Russia on 18 July, it returned to eastern Ukraine shortly thereafter and could be seen being used by separatists to transport military equipment. In a photograph shared on 6 August 2014, the low-loader can be seen transporting a BMP infantry fighting vehicle through the streets of Makiivka, just east of Donetsk. Later that month, on 26 August 2014, a photograph and video of an identical low-loader were posted online. The video featured a woman who had appeared in previous separatist-filmed videos, and it appears that the low-loader was being used to transport a damaged vehicle. 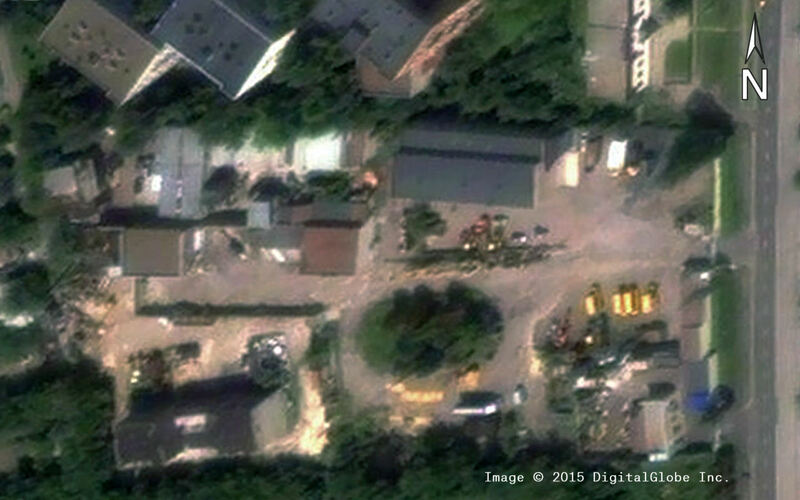 Once again, historical Google Earth satellite imagery shows the low-loader in the yard on 9 August, while on 3 September it has since clearly moved. The PDF version of this piece is available in English and Russian. I find this a bit hard to understand. There are several photos of a buk on a truck. None of these can be verified as to the date. Is that correct? Should that not call into question the other photos? Actually the photo could not be an evidence because EXIF is easily falsified. The originals can be, and algorithms can be created to figure out was faked or altered or unaltered except for sizing, if they want to use a posted photo since the original is not available. There are certain free or almost free programs and apps that let you do that now. Be assured that professional investigators have even better tools in their toolbox. why on a second photo i see copyright of 2015 year of dg? Because it’s from Google Earth. Check Digital Globe catalog. Image of 2015 exactly from digital globe. Not a google. And image of 2014 is from google. I guess I should try to be more understanding of the Russians that read here that do not understand how an investigation in a democracy works. Since they have lived all their lives in a totalitarian police state, and do not really have an understanding of freedom. A totalitarian police state were justice is carried out by those who can give the biggest bribe to corrupt police, judges and prosecutors. Usually the biggest pockets of an embezzling government is that government that uses it to perpetuate the corruption. The investigation is just fluff, the important thing is who has the biggest checkbook. This is fully demonstrated by the case against Ukraine’s first female fighter pilot accused of spotting for a sniper behind enemy lines over 2 miles away with a pair of binoculars from atop a Signal Tower. After which she is smuggled across the Russian Ukrainian border to Moscow by FSB agents with a bag over her head and then Moscow charges her with crossing the border illegally. The whole case is a farce, which is plainly demonstrated by the court documents that are being released to the public by her lawyers. Yes, I should try to be a little more understanding, but probably not, since they have had NCIS on their TV’s for years to show the work of investigators and prosecutors. Well I have just read your post here and you have a complete misunderstanding of Russians, bordering on the insulting. I will preface by saying that yes the Russian government and bureaucracy is corrupt, that they embezzle and steal (the ones in power anyway), yes the courts are corrupt, if you have deep pockets you can buy your way out. Most Russians know this, that however does not mean all Russians are thieves and liars. However Russia is far from a police state. I’m speaking from personal experience having A) Lived there for four years, late 90s, early 2000s, B) I visit there once a year and I don’t see the FSB carting people away for expressing opinions that differ from the established government line. The thing is people wonder why Russians don’t rise up and get rid of Putin and his cronies, to be replaced by whom? Russians know the news is BS, that their government lies to them but after all they have been through and as we see in the Ukraine you would replace one bunch of corrupt government officials with another bunch who could turn out much worse. I think some people here need to get an understanding or Russia and Russians. Of course boggled I have to ask, have you ever been in a situation where you wonder if you are going to get paid each month and put food on the table. The situation is a lot more complicated than Putin bad, Russians dumb and why can’t they see liberal democracy is better. Bob, I try to make a conscious effort to place my blame mainly in my posts on the corrupt organized criminal government in Russia. Not on the Russian citizenry itself. Russia covers a lot of ground, and many of them are relying on a pony express system to get their news even today. Communication is a problem there. However, the citizens of Moscow, Saint Petersburg, and other larger cities do not have that problem of communication and actually know what is going on and still support their organized criminal government and the things they tell the people. So some of mine, and other’s condemnation ends up condemning Russian citizens in general, when they are really meaning to complain about the Uncle Vova and his supporters. It is a mistake ‘westerners’ make, just the same as many of the Russian citizens make the mistake of condemning America citizens, when their judgement is more for American foreign policy decisions. I try to place blame in my posts squarely on the Kremlin and its infrastructure and it’s neonazigroups they send into Ukraine from there. I try to make the effort not blame the Russian citizens as a whole. But I am human and might make a mistake from time to time in my free thinking typing. I have lived in a tent for a month, AND I have been taken in by friends to live in their home because I lost a job and it was a choice of eat, pay rent, or pay for heat, or grovel to friends and contribute the best I can until I got back on my feet. I chose to pay rent, kept my lease and credit ok, and turn off utilities and live with friends. I took charity from friends, but I did not take it from the government. And yes, I have known Russians from Omsk, Moscow, Novosibirsk, and many other places as exchange students associate with my family and various groups of people I know. I have also been to Russia before, but only 2 times. I have been to Ukraine more often, but Poland the most. AS my comment above pointed out and you agreed with me on ALL my points except the fact of it being at the stage of a police state right now or in the past when you have been there. I can agree that it is not technically a police state, however, it is a state run by organized criminals with their own rule of law. And organized criminal sponsored media that reports to all of Russia. In some places if that is all the news they get of the outside world, why shouldn’t they trust it, it is their only source of information. And that is what Uncle Vova and his cronies are hoping for and using. Uncle Vova and his state sponsored media make claims of over 80 percent approval rating in Russia, and I believe that is as true as his election results in 2012. No Russian believes those results either, except for certain pockets. Yes, I think he has pockets in Moscow and other cities where he does have that high an approval rating because they are in some sort of financial benefit from organized crime. But not in all of Russia. Regardless, my point in the above post is a post to the many commenters I see that demand the USA release to the public classified satellite info before the investigation is done or or the court verdict in the MH17 disaster, as well as other various aspects that are not how the Court of Law’s procedures work. I have made many posts regarding how western courts procedures are, but still they come with the same asinine questions. The comment above was more an ‘ARGGHH’ moment then anything else. The facts are – Moscow’s government is recruiting and sending Russians into Ukraine, is sending soldiers into Ukraine, is sending military LETHAL equipment and ammunition into Ukraine, and refusing to allow Ukraine to control its own border – they have even destroyed Ukrainian Border Checkpoints with missiles and artillery launched from inside Russia. Moscow’s government is escalating and fueling the war with their media, their people, and their military travelling across Russian highways. Moscow courts, moscow media, moscow military, moscow banks, moscow fascists and moscow organized criminal groups all support this and fuel it. And your right, a thing for Russians to think about is who the next in charge will be AND if they will have any choice at all in the matter. The media is pushing for the Chechen leader to be it, I think. That is a scary thought to me. Russians will only get a vote if they rise up and demand an end to the corruption that is Moscow. Will they? I do not know. One thing I do know is the intelligent people and their families are leaving Russia at about a million a year. Unfortunately, that to me says their may not be left anyone intelligent to run the country that is not corrupt, and there is not going to be the people who fuel the change that Russia so desperately needs. You are right, the situation is not black and white, matters usually are not. Everything about Russia is coming to a head, losing Ukraine, losing large parts of intelligent population, organized criminal control of a state gas company, etc. The Kremlin is digging a hole, and instead of trying to climb out and fill it back in and solve their problems, they are digging themselves deeper and deeper and sending Russia itself into bankruptcy, isolation, and failure. I have Russian’s that I will be friends with until the day I die and I like them as friends and I will not condemn all Russians as thieves and liars. However, until Uncle Vova and his cronies are stopped and eliminated, Russians are okaying the actions of the Kremlin and they will earn that stereotype and that isolation for many generations to come if they do not begin changing the Kremlin organized criminal structure. The Kremlin’s and their governments actions are earning them that stereotype, correct or not. The USA will not do it for them, especially when over 8000 nukes are involved. It must be the Russian population. The USA however will assist to a point and be there to attempt to clean up the pieces and offer a hand up, but they will not do everything. Russians by not condemning the Kremlin’s actions loudly at this point are earning Russian generations to come the term – unwanted. Fare thee well and let’s pray a change comes for a brighter future for Russia’s children. Почему россияне поддерживает Путина? Если вы бы изучили историю России начиная с 1991 по 2015 года, вы тогда бы поняли. Кто по вашему достойный президент России? Может лучше сразу Барака Обаму назначить президентом России? No, I would not let BHO appoint anyone, I am not a fan of his or his left wing ideology, America made a bad choice in him and faces a worse future if it continues and puts Hillary in office. I think a good President would be one that would help Russia into the 21st century. Uncle Vova still uses the mentality that of a old Russian cold war hawk. He is corrupt as can be and sees fattening his own pockets and those near him. He does not see bringing up the Russian citizens to a better life, just those of Moscow and near Russian military bases. I had hopes for Uncle Vova and Medvedev, but they have shown again power corrupts. I know the Russian mentality well and have studied the irrationality of many of its thinking. More then half of Russia’s population lives day to day and many villages do not have running water or electricity. It is full of riff raff that are willing to con anyone with no morality for a dollar. Not saying there are not honest people there, I have met a lot of upstanding modern ethnic Russians both in and outside of Russia. The Kremlin spins the downfall of USSR to the fault of the USA and democracy, and the Russian people are taught to hate that. In all reality though, it was Kremlin policies that brought USSR to ruin, and in many ways Stalin’s liberation of countries after WW2 was really an occupation and hostile annexation. If you won’t admit that to yourselves, then you face a larger mountain to climb. The Kremlin won’t tell you Russians that the USA was instrumental in financial support of Russia even today, it does not fit into their plan of always calling the USA evil, but the government of Russia is the one that has to decide how it spends it. They walked down the evil path themselves. And are unwilling to change. The USA wants and wanted a partner in Russia, but Russia spends a lot of propaganda money on creating the great American Satan. And the Russian citizens gobble it up, until they go outside of Russia and see what a big different world it is then what the Kremlin taught them. The Kremlin creates a lot of illusions for the Russian people. And the Kremlin sponsored media says MSM is manipulative. I shake my head in pity. When you have corruption that is in every part of society that the citizens rely on for protection, job security and national security, it needs to be broken. The British and Europeans have not been helpful either, since they have helped that corruption to stay around. They have allowed and in some ways encouraged the industrial organized crime that Russia practices. They like the money and do not attack money laundering from Kremlin’s organized crime pet projects like human trafficking, drug smuggling, blackmail, extortion, arms smuggling, etc. the way they should. Do I have all the answers? No, I don’t. Will Russian’s have a voice in their future? With election fraud at the Presidential level, and Kremlin sponsored propaganda spouting out false 90 percent approval ratings, my hopes are not very high. I have hopes for them. To be honest, I think a good President for Russia would be a simple person. A farmer from Siberia, a businessman that has forgotten the Soviet mentality because he has seen the rest of the world, a woman even possibly Uncle Vova’s daughter. Russia kept up the mentality of it is Russia against the world and I believe that actually in 1991 Russia should have been looking inward instead of continuing this mentality. Do you understand why a million people leave Russia every year with their families and never want to go back? And that has been happening at least the past 5 years, imagine if it keeps happening. Do you understand almost half the Russian population is living in the same or worse conditions as their ancestors that lived in 200 years ago? Sure Moscow has gotten prettier, but what does that do for the family out in Siberia or Omsk? They only way to stop that is improve Russia. Get rid of Kremlin controlled media. Kick out the half the world’s current neo nazi fascists that call Russia home, Russia has close to 100k at last count.. Send all of them to Africa or Somalia to fight the pirates there. Fire all your corrupt judges and police men. Create accountability laws for them. Tell the Moscow organized criminal groups and anyone that practices blackmail they are going to jail. Yes, Russia almost has to become a police state to change. The police though are actually the Russian citizens. If they don’t, they walk a path of evil virus within the Russian body that kills it. The virus is the people in the Kremlin and Moscow. The mentality of the Russian population has to understand that and that the USA is not the enemy that the Kremlin creates. The USA is more of a Doctor that says to someone that is ill, this is how you get better. We will help you if you want to help yourselves, but if you want to ignore that advice and keep eating lead paint, your going to get sicker. The USA does not want to see the Russian people fail, and always has been willing to offer a helping hand even after we have to discipline you for your leaders being bad. Have you seen NATO fly a bomber with 2 nuclear bombs fly over Saint Petersburg? Russia flew one over the English channel. Now what does that say to you? Who is the threat to worldwide safety? If the Russian people want to continue to denying its roof is caving in and not want to work to fix it, then they have no one else to blame when they sleep in a wet bed. A change or death is coming to Russia, the Russian population as the patient can decide what it wants to do. Kill the virus is a change and can mean a good life, or deny until the day of the painful and destructive death which might harm all those around them. I guess you never saw this Boggled? Hey Hey its the Monkee’s! oops sorry a little nostalgia there. I never said that there was no corruption in the USA. However it is not as prevalent as the recent scandals in British Real Estate or in the whole government structure of Russia. Uncle Vova is involved with drug smuggling personally. He has also the support and coordinates with the Moscow organized crime families. Russia is full of corruption in every element of government, just as Ukraine is trying to break away from now. The organized crime families do not want to give up their ‘silk road’ or their most convenient way of getting things from Asia and countries like Afghanistan – poppies – to those who have the money for it over in Europe, at the same time the Russian organizers can skim off a little off the top for themselves. Slowly, their routes are being cut off. Anyways, in Russia an honest government agent who does NOT ask for bribes is an exception to the rule, where in the USA a government agent that asks for bribes is an exception to the rule. Yes, there are cities where corruption has brought its downfall in the USA. Detroit – Democratic lead since the 50’s I believe is just one such city. Chicago’s corruption is not much better. To be honest, those places are about the closest I could come to Russia in America on level of corruption. And even with that being said, Detroit and Chicago are less than ten percent the level of corruption that is the expected way of life in Russia. Mad Dog, Speaking of guys working overtime, the site consortiumnews by ‘independent’ journalist has been pumping out those anti American anti Ukraine anti democracy articles overtime. I have had over 10 comments removed by their moderator(s). Not because they are rude, insulting, vulgar, obscene, bullying or threatening but because they counter Parry’s narratives and point out his hypocrisy. One article of his titled ‘Whining White Southerners” I wrote – Look at that title and ask yourself, are you being racist by not simply naming the article ‘Whining Southerners’ – and yep that comment was eliminated. The common trait in many of those comments deleted were that I stated CIJ – the official name for his organization and what is filed with the IRS – has received donations from Kremlin proxies such as RT America and in two I asked what Abe (Parry’s Teacher Pet and main comment board activist) got for his frequent postings, more then 8 a day, on the site. I placed these in there repeatedly just to see if that was the reason they were getting deleted while I attempted to challenge Parry on his articles with a variety of counterpoints. Only thing I can guess, is they either didn’t like to be challenged – you will not find many counter arguments in the comment board – or he is not willing to openly admit he receives funding by the Kremlin or its proxies to his other donating organizations out of fear of losing those funds. I know it is not worth my time going there, similarly to going to RT’s site itself and countering their articles. It is amazing how in lockstep the Krmlin Propaganda and Parry’s articles are. And how he followed the MH17 Kremlin story line almost word for word. I wonder if he still deserves his 501c3 status with as much political BS and antiDC propaganda and slander he throws around especially trying to discredit future candidates. It has been 15 years since the last review of his status and he has received donation of over 800k in the last 7 years. I would not suggest you write anything there about Kremlin or Kremlin proxies donating to his site or else your comment will be deleted and you will gain a future ‘red flag’ for moderation of every posting. thanks for the info Boggled. Will wander over and take a look without any bias (at least at first). No Kremlin bashing either, promise. Maybe a comment or two about the capabilities of AN-26’s will suffice. What is this about several white cabbed low loaders being in that yard on July 27th. Any take on that? My feeling is that although the truck and trailer rental center MIGHT have had that many trucks in its possession, satellite evidence is to the contrary. I do not have a bullet list of all the vehicles owned by the company, or if it shared the facility with another business of Donetsk city. It is possible all the equipment the company owned was out on rental during the middle of the day on July 2nd, but I doubt it. They would be doing booming business if that was the case. I guess that on July 2nd that might be the case and the terrorists were utilizing all the rentals they could and the funneling of money in droves for transport equipment, and then thought to themselves, why are we paying for it, let’s just commandeer it. The reasons for the increase during the middle of the day in the en of July and August would then be they had staged all their equipment and needed to wait until the next large supply of Russian military armaments came in. I believe that the Russian military intelligence in escalating the conflict sent in many trucks to transport Russian military equipment and ammunition from the railroads to their bases, they needed a storage yard for the transport vehicles. The rental yard was convenient central location that they ‘commandeered’ for their trailer and semi storage or they got tired of paying for the rentals. Russia was preparing for its various cauldrons and the BUK was just the beginning of the large scale transport of Russian military equipment around Donbas. The increase in ‘lowboys’ was due to their need to transport more and more Russian military supplied lethal equipment, Grads, Tanks, BMP, and BUKs, as well as the Russian need to pilfer various Donbas industries of their repair supplies that Russian military desperately needs inside Russia. Similar to the “Humanitarian’ Convoys that brought into Donbas various supplies then returned to Russia with helicopter engines, space rockets supplies, and other sundries. Also the need to remove destroyed Russian equipment from conflict areas that had been attacked by Ukrainian military but the Russians still controlled in an effort to continue on the deception of Russia Military equipment not being used. That is my belief their was a large scale infusion of Russian military equipment after July 17th and this was just one of various storage places for the transport vehicles, hence the increase in overall semi’s and various trailers. One thing to note about this storage yard is it also had diesel repair capabilities for the transport semi’s and trailers which made it a good place to commandeer. Possibly with mechanics and employees that were in support of the DNR cause. They had to make money to support their families after all. The Ilovaisk cauldron or котёл happened shortly after MH17 and it was fueled by a large and rapid increase in Russian military equipment and intelligence. There is also the fact that now Donbas has 50 times more military equipment in it then it has ever had before, now I wonder where they got all that? They needed a way to transport that stuff around that did not completely damage all the highways in Donbas and get them to the battle zones. Russian military transports may have been one thing driven directly across the Russian controlled border and stored elsewhere, but they also needed other transports for those that came in by rail, part of the logistics thinking of the GRU. This may have been one of those various staging areas for the transport equipment that drove those tanks and Grads and BMPs around, hence the escalation in new equipment at the yard. It is an evolving conflict and as the Russian military machine made its plans for escalation and gave directions to the terrorists, it then needed places for all the support vehicles. That is my feelings and opinions for the increased equipment in a commandeered yard, especially the larger transport trailers. There at least until they could be returned to Russia. Yes, I do think Bellingcat should have posted the companies equipment list in association with this article prior to being commandeered, it would have been relevant. BUT they may not have been able to obtain it. Maybe they are working on it, I do not know. It is obvious that after it was commandeered it was a busy transport yard, vehicles and trailers were moved about, but kind of strange to see so many of them there during the day. A lot of guesses and hypothesis and logical thinking, and I am sorry for that and that I cannot provide additional conclusive evidence to say exactly why. DNR, Russia, or the owner of the yard would probably be able to supply more, but we know two of those are not talking or if they are, they are full of denial and deception. Conflict was initialising by US. Russia was to busy with Olympic Games and could not react immediately. Remember the previous conflict in Georgia started at 08.08.08 – exactly the day of beginning Olympic Games in China. There is common feature of US politicians to use Olympics against Russia or USSR. Ossetian separatists began shelling Georgian villages on 1 August, with a sporadic response from Georgian peacekeepers in the region. The Georgian Army was sent to South Ossetia on 7 August to defend civilians and restore order. Most of Tskhinvali, South Ossetia’s capital, was recaptured in hours. Georgia later said it was also responding to Russia moving non-peacekeeping units into the country. Russia accused Georgia of “aggression against South Ossetia” and officially launched a large-scale land, air and sea invasion of Georgia on 8 August under the guise of “peace enforcement” operation. Russian and Ossetian forces battled Georgian forces throughout South Ossetia for four days, with the heaviest fighting in Tskhinvali, until Georgian forces retreated. Russian and Abkhaz forces opened a second front by attacking the Kodori Gorge, held by Georgia. Russian naval forces blockaded part of the Georgian coast. This was the first war in history in which cyber warfare coincided with military action. An active information war was waged during and after the conflict. Elliot_au, it sounds to me like the Russian’s were the aggressors and used the distraction of the Olympics to cover up their large scale operation to attempt to take back South Ossetia. While the MSM’s attention was on China, the Kremlin waged war. Just like Sochi, the Moscow state run organized crime empire was tired of the protesters that were all over Ukraine and felt the had to do something while everyone was distracted by the Olympics. What will MSM care if a few protesters get taken out by Russian Snipers especially if Kremlin sponsored media can yell out loudly about Ukrainian neonazis and the evil USA State Department? 100 protesters murdered and a thousand injured? Kremlin doesn’t care about that, they have killed off a rebellion and MSM attention was on Sochi – the Olympic location full of incompetent – stairways ending at a door in a solid wall, handicapped ramps that began as stairs – and corrupt building contractors and yellow water to drink and bath with. It did not go so well in Ukraine though, the resolve there and fact it is a lot larger country and the fact Ukrainians were sick and tired of Moscow organized corruption being in their mist which they saw for generations. They sought a way out from Moscow led corruption. One wonders when and if the Russian population will do the same and break the yoke of Moscow’s corrupt elite and its totalitarian government. So your right, someone used the distraction of Olympics over and over again to distract MSM while they waged covert wars. It was the Kremlin, with Uncle vova in charge both times. More selective “evidence” from Bellingcat. While on 27th July there are no less than FIVE low loaders with white cabs. Just a reminder, that if it was not a reliable source of info that was reported by Strelkov’s press agents or whoever, then why did so many of the Kremlin sponsored propaganda artists carry it? Are you saying then they are not a reliable source of info?